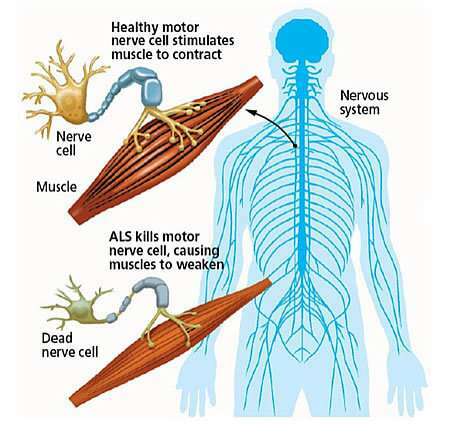 ALS, also known as Amyotrophic lateral sclerosis, is a neuro-degenerative disease which affects the motor neurons that control muscle movement. There are two different forms of ALS, sporadic, and familial. Sporadic is the most common between the two, making up 90% of the ALS diseases. familial cases are when the disease is passed from parent to child. Most people associate ALS with genetic mutations and while genetic mutations do not cause this directly, they can increase the risk. A gene called the C9ORF72 is the most frequently mutated gene in ALS patients. This genes mutations cause 25 to 40 percent of familial ALS cases and 7 percent of sporadic cases. This gene mutation can also cause another disease called FTD. Its not clear yet on how this gene causes the disease but its thought to have something to do with the result of toxicity which is the production of the deficient protein which is toxic to the cells. The mutation of this gene or absence of this gene can cause ALS. Another gene called SOD1 cause 12 to 20 percent of familial ALS and 1 to 2 percent of sporadic ALS. This gene generally provides the instructions that build the enzyme called superoxide dismutase. Researchers think the gene mutations lead to the formation of superoxide dismutase which is harmful to cells. Another gene called TARDBP which causes 4 percent in familial and 1 percent in sporadic ALS. Mutations cause the protein that this gene produces to aggregate outside the nucleous which harm the cell. The FUS gene is another gene which causes 5 percent in familial and 1 percent in sporadic ALS. This also plays a similar role that produces a protein and when mutated, can damage motor neurons causing ALS. There are always more genes being discovered to have something to do with ALS including VCP, ATXN2, and VAPB gene. Aside from gene mutations, the disease is autosomal, mostly dominant which means it is inherited. An individual with an autosomal dominant gene has 50% chance of passing it down to their children. When it is recessive, both parents must have it to pass it down. Usually this is mixed up with someone who has sporadic ALS. Rarely its inherited in an X-linked dominant manner. Because this is on the X-chromosome, it is generally only causes rarely in men. Men can also only pass it to their daughter. More is always being learned and there is constantly being more research done in the hopes of finding a cure. To me, this research is groundbreaking and although, we still do not have a cure and may not even be close, we have a start. We know most of how it is caused which is huge for any disease because with that, there becomes ways to test and hopefully prevent the disease. People can now be tested for many diseases by looking at their genes and this is great for testing for ALS. Whats also incredible is that we can now look at some of the genes this comes from and hopefully stop the mutations or be able to act on a quicker basis to either cure of prevent the disease. There is still a lot to learn here but it is looking good with the amount of research so far. Hopefully one day, ALS will be cured with this great research. This is interesting to understand the different causes of ALS. The first thing to bring this disease to my attention was the Ice Bucket Challenge a few years ago. I always knew the symptoms but I never knew it was caused by a genetic mutation and was autosomal dominant. I also hope they find a cure soon, as many suffer from this illness.